In this guide we will walk you through the process of creating a Formyoula form. If you have any questions please email us Support@Formyoula.com. 1. Go to Formyoula.com and clink "Sign In". 2. 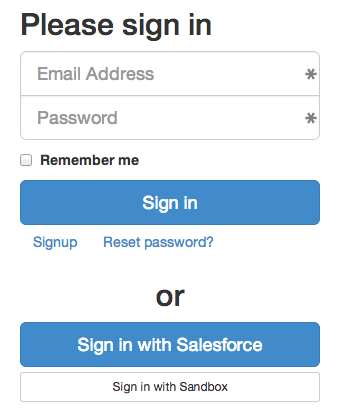 Click "Sign in with Salesforce" or "Sign in with Sandbox". 5. Click "Rename" to give your new form a name. 6. Forms can have one or more pages, give the first page a name and click "+". 7. Select fields from the "Drag & Drop Components" section. 8. 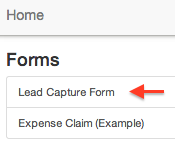 Drag & Drop required fields on your form. 9. Click on the pencil icon and rename the form element. 10. Click "Save & Close" to save your form. 11. Click on "Actions" and select "Add/Edit Connections". 12. Select "Salesforce" as the connection type and click "Create Connection". 13. Select the Salesforce object you would like to link this form to and click "Save". 14. Map Form Fields to Salesforce Object Fields by clicking "Create Map". 15. Now click on the "Dashboard" link to navigate back to your dashboard. 16. Here you can see the Salesforce connection next to your new form. 17. Click on the "Get Mobile Apps" button to open the mobile application list. 18. Click on the "Mobile Web App" link. 19. Click on the form you just created and fill in the details. 20. Now on the form entries screen you can see recently submitted forms. 21. On Salesforce you will be able to see the record you just created.